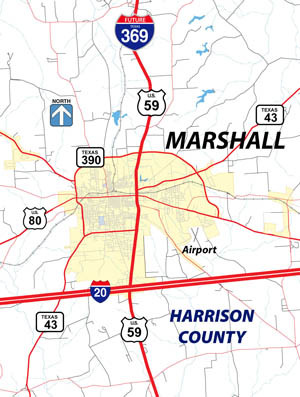 US Highway 59 runs north and south through the center of the City of Marshall and is lined with large retailers, hotels, campuses and a civic center. Following a bottom-up planning process established by TxDOT over the past few years, a 15-member citizen working group from the community is at work reviewing ideas and seeking citizen consensus on potential routes for Interstate 69 to flow through or around Marshall and to interconnect with Interstate 20 which runs east-west at the city’s southern edge. The working group held their third meeting in this week. The group is chaired by Harrison County Judge Hugh Taylor who is also a board member of the Alliance for I-69 Texas. The working group is leading the process in conjunction with a route study being coordinated by TxDOT. Ultimately the route study and the working group’s efforts will result in the identification of an interstate route option that will then be studied in detail as part of the environmental clearance process. This initial route study is expected to be wrapped up by the end of the year. The TxDOT study includes consideration of two broad options. The first would be to convert the existing US 59 (End Street) to an interstate highway. The second is construction of the interstate on another route that might include portions of already existing highways such as Loop 390. Taylor said he is hopeful that the working group can settle on a preliminary route concept that it can recommend to TxDOT and the community. The next step will be to decide how best to inform local citizens and to get their input on route options. Judge Taylor said the working group is getting extremely valuable technical support from TxDOT in their option evaluation process. Federal and state officials have determined that the I-69 System improvements from I-30 at Texarkana south the Tenaha in Shelby County will be numbered as Interstate 369. The first section in Texarkana was signed as I-369 and added to the Interstate Highway System last year. A similar working group process used in Lufkin and Nacogdoches came to a successful conclusion in 2013 when a community consensus developed in support of a set of relief routes that utilize substantial existing sections of US 59 but bend onto proposed new right of ways to skirt densely developed areas. 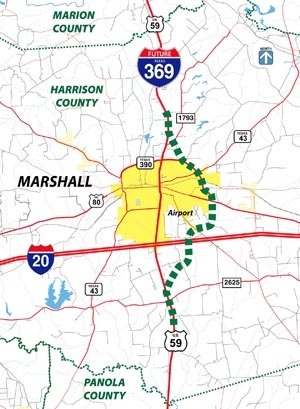 This is the conceptual route that became the consensus recommentation of a citizen-led Working Group which evaluated 13 potential options to the east and west of Marshall. Sunday evening traffic on US 59 just north of I-20 in Marshall.